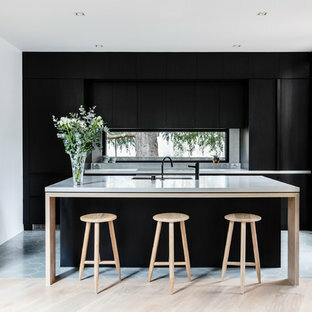 Contemporary galley eat-in kitchen in Melbourne with an island, a drop-in sink, flat-panel cabinets, black cabinets, white splashback, stainless steel appliances, medium hardwood floors, brown floor and black benchtop. Inspiration for a contemporary kitchen in Melbourne with flat-panel cabinets, grey cabinets, stainless steel appliances, light hardwood floors, an island and beige floor. Design ideas for a mid-sized contemporary l-shaped eat-in kitchen in Other with green cabinets, wood benchtops, white splashback, ceramic splashback, light hardwood floors, a drop-in sink, flat-panel cabinets, stainless steel appliances, a peninsula, beige floor and brown benchtop. This is an example of a contemporary open plan kitchen in Sydney with a single-bowl sink, flat-panel cabinets, beige cabinets, metallic splashback, mirror splashback, black appliances, an island, beige floor and beige benchtop. 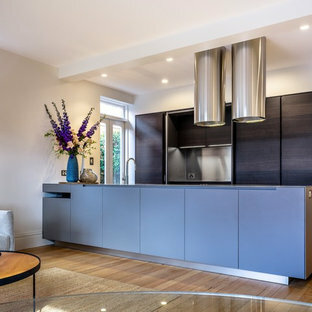 This is an example of a contemporary galley kitchen in Melbourne with an undermount sink, flat-panel cabinets, black cabinets, window splashback, panelled appliances, an island, beige floor and grey benchtop. This is an example of a mid-sized contemporary u-shaped kitchen in Melbourne with black cabinets, stainless steel benchtops, white splashback, black appliances, light hardwood floors, white benchtop, an undermount sink, flat-panel cabinets, no island and beige floor. 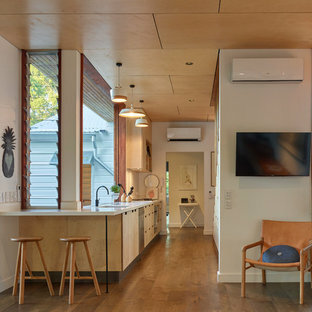 Small contemporary galley kitchen in Brisbane with flat-panel cabinets, light wood cabinets, quartz benchtops, white splashback, stainless steel appliances, brown floor, white benchtop, an undermount sink, window splashback and medium hardwood floors. 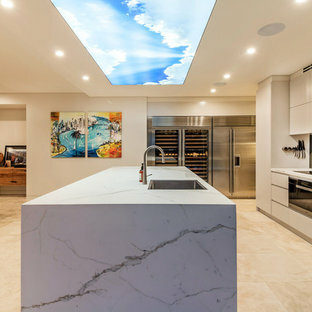 This is an example of a contemporary open plan kitchen in Sydney with flat-panel cabinets, blue cabinets, light hardwood floors, a peninsula and beige floor. 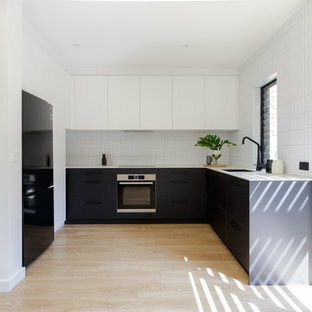 Photo of a contemporary galley kitchen in Melbourne with flat-panel cabinets, black cabinets, white splashback, subway tile splashback, an island, white floor and black benchtop. 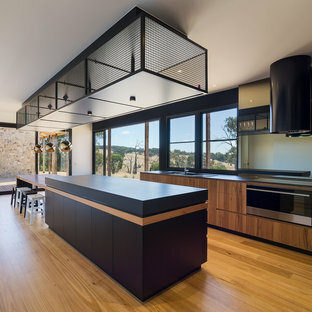 Contemporary l-shaped open plan kitchen in Perth with flat-panel cabinets, white cabinets, window splashback, stainless steel appliances, light hardwood floors, an island and brown floor. 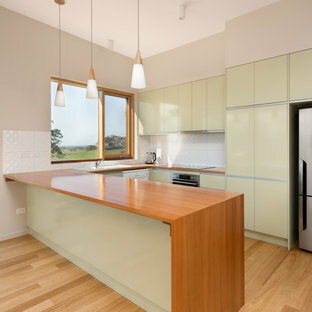 Photo of a mid-sized contemporary l-shaped kitchen in Melbourne with flat-panel cabinets, white cabinets, beige splashback, medium hardwood floors, brown floor, an undermount sink, panelled appliances and an island. 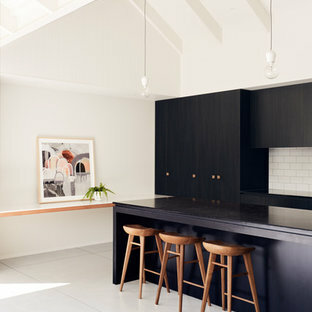 Contemporary l-shaped eat-in kitchen in Melbourne with a double-bowl sink, flat-panel cabinets, green cabinets, panelled appliances, dark hardwood floors, no island, brown floor and black benchtop. 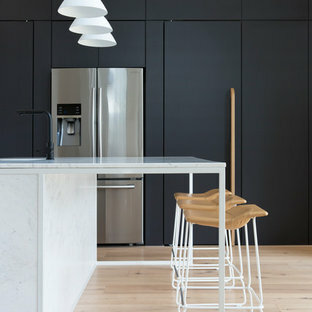 Photo of a contemporary galley eat-in kitchen in Melbourne with a double-bowl sink, flat-panel cabinets, white cabinets, medium hardwood floors and an island. This is an example of a contemporary open plan kitchen in Brisbane with an undermount sink, flat-panel cabinets, white cabinets, wood benchtops, window splashback, black appliances, an island, beige floor and brown benchtop. Design ideas for a contemporary galley open plan kitchen in Sydney with flat-panel cabinets, white cabinets, white splashback, stainless steel appliances, concrete floors, an island, grey floor and white benchtop. Design ideas for a contemporary galley eat-in kitchen in Sydney with a drop-in sink, flat-panel cabinets, grey cabinets, window splashback, concrete floors, an island, beige floor and white benchtop. Contemporary l-shaped eat-in kitchen in Gold Coast - Tweed with an undermount sink, flat-panel cabinets, black cabinets, wood benchtops, metallic splashback, mirror splashback, black appliances, an island and beige floor.